It isn’t that Yamaha’s YZ250X delivers staggering performance for an out-of-the-crate 250cc two-stroke off-road machine, nor is it the fact that we never saw the YZ250X coming before Yamaha sprung it on us. It’s both of those things and more. Following a path similar to the one Yamaha has used to create class-winning off-road machines out of its class-winning four-stroke motocrossers, the YZ250X takes Yamaha’s latest two-stroke motocross technology and repurposes it for off-road competition. To that end, the X model features a slightly milder state of tune thanks to lower compression, altered power valve settings and a different expansion chamber. The X engine trades some of the YZ250’s snap for greater tractability. Yamaha also fitted the X with a more off-road friendly 18-inch rear wheel and tire. 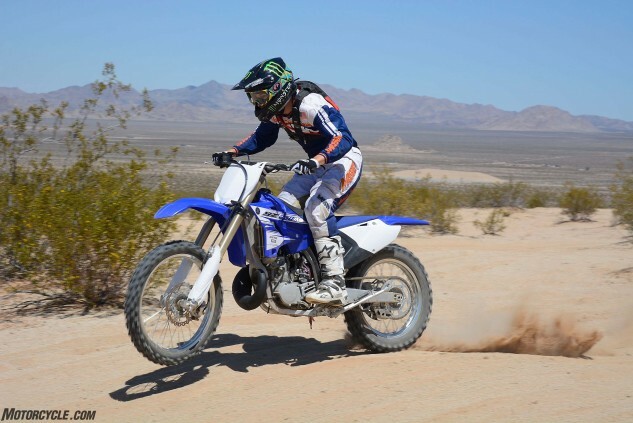 But the real change comes in the YZ250X’s wide-ratio five-speed transmission, which features a shorter third gear a slightly taller fourth and a warp-drive fifth gear that helps the bike gobble up wide-open desert expanses like Pac-Man. 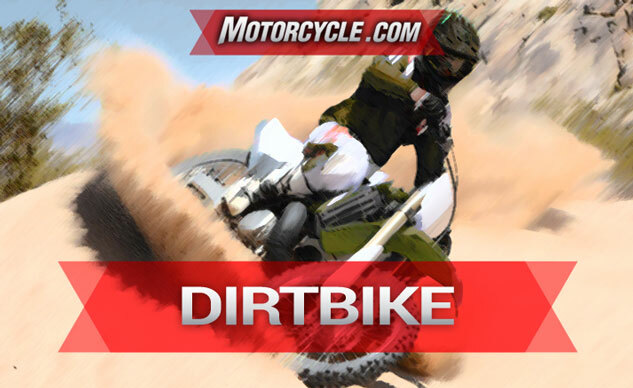 It also doesn’t hurt that the X’s KYB SSS fork and shock have been dialed-in perfectly for off-road use, giving its bilateral beam aluminum chassis excellent manners whether you are blitzing endless sand whoops at Mach speeds or paddling through rocky stream beds. It’s fast, it’s light, handles like a feather, and it can tackle any terrain in its path. The 250X might lack the broad-ranging versatility of our runner-up in this category, but it’s a much lighter, sharper-handling and racier machine that was our favorite of 2016. Adding to Yamaha’s rich legacy of off-road racers, which includes such historic models as the YDS2C, the DT-1, the IT series and the YZWR, the YZ250X is our choice for Dirtbike of the Year. When you can already lay claim to the title of producing the best 450cc motocrosser on the planet, what do you do as a follow-up act? If you’re Yamaha, you take the YZ450F, fit it with a convenient electric-start system, a wide-ratio five-speed transmission, a 160-Watt generator capable of powering accessory lighting, an 18-inch rear wheel/tire combo, and you tweak the ECU and suspension settings to favor off-road use over motocross. The end result is the YZ450FX, another roaring success for the tuning fork company. Just like last year’s MOBO DirtBike runner-up, the YZ250FX, the YZ450FX is a hell of a following act, delivering practically all of the fire-breathing punch of the YZ450F with the same excellent-handling bilateral beam aluminum chassis and the same awesome 48mm KYB SSS fork and shock, which have been re-tuned to give the 450FX an extremely comfy ride in the outback. What makes the YZ450FX all the more amazing, though, is that despite its electric start system adding about 15 lbs. 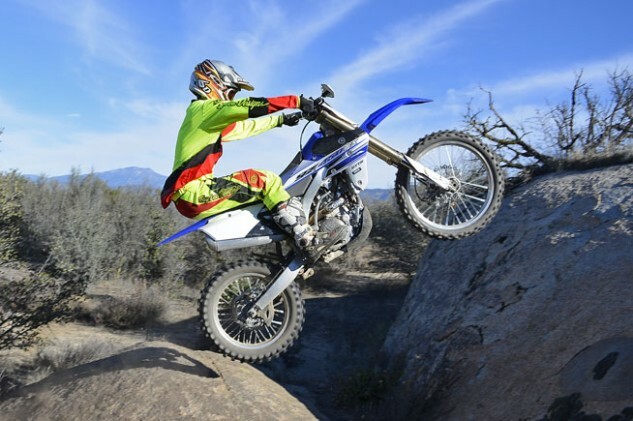 to the total package, the FX loses only maybe a half step to the YZ450F on a motocross track. We’re talking unprecedented versatility here! If we could own just one 2016-model dirtbike, the jack-of-all-trades Yamaha YZ450FX would be it.